Slice each Portobello mushroom cap into 6 even strips (24 total), keep at room temperature. Over medium-high heat, heat oil in a large non-stick sauté pan. Add mushroom strips and sauté for approx. 3 minutes; add garlic and sauté for an additional 2 minutes (or until mushroom strips are fully cooked/softened/browned and garlic is lightly browned). Add sesame seeds, gochujang sauce and buckwheat honey to mushrooms. Gently toss to evenly combine and cook for approximately 30–60 seconds to glaze the mushrooms; keep hot. Finished mushrooms should absorb all the ingredients and have a glazed/sticky consistency and be fully coated by the ingredients. To serve, place approx. 1/4 cup of shredded lettuce in each of the 8 taco shells. 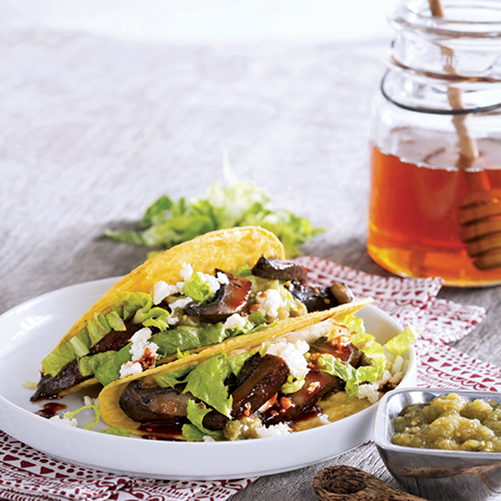 Top each lettuce-filled taco with 1 teaspoon salsa verde and 1 teaspoon feta cheese crumbles. Top with 3 hot slices of glazed Portobello mushroom strips.